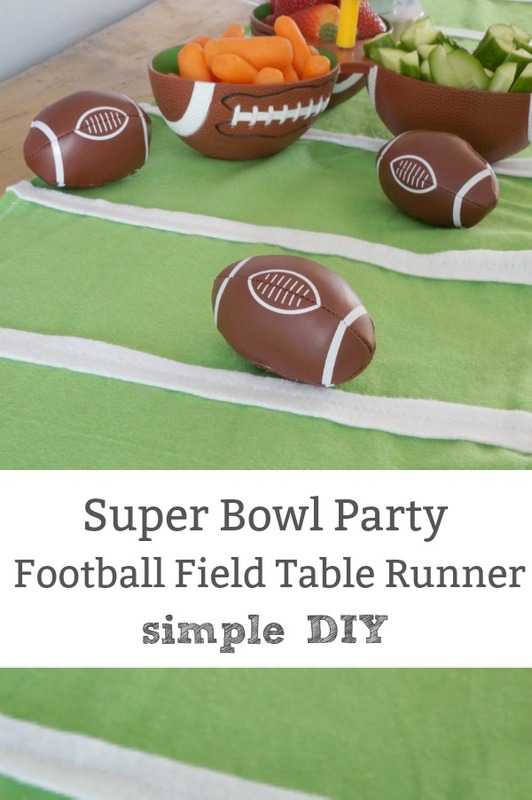 Quick DIY - Super Bowl Football Field Table Runner - Touchdown! 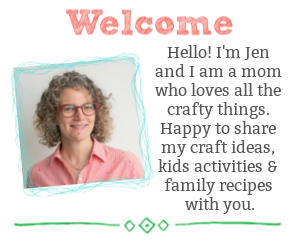 You are here: Home / craft / Quick DIY – Super Bowl Football Field Table Runner – Touchdown! 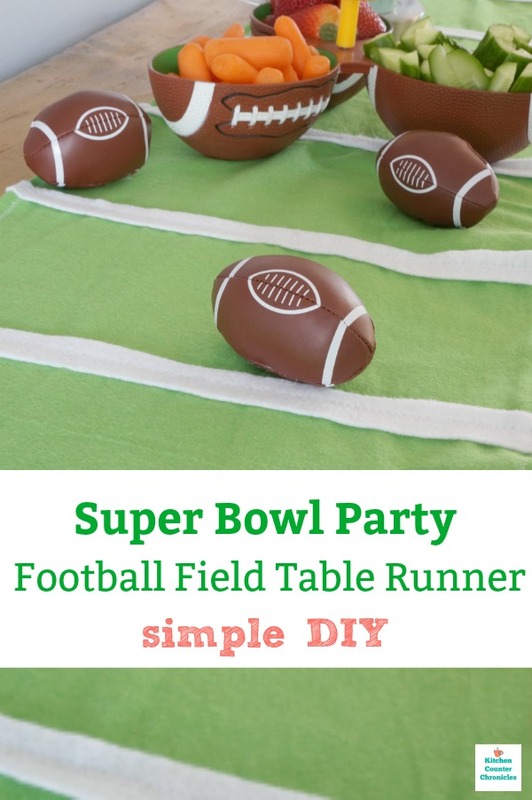 Quick DIY – Super Bowl Football Field Table Runner – Touchdown! We love watching the Super Bowl. 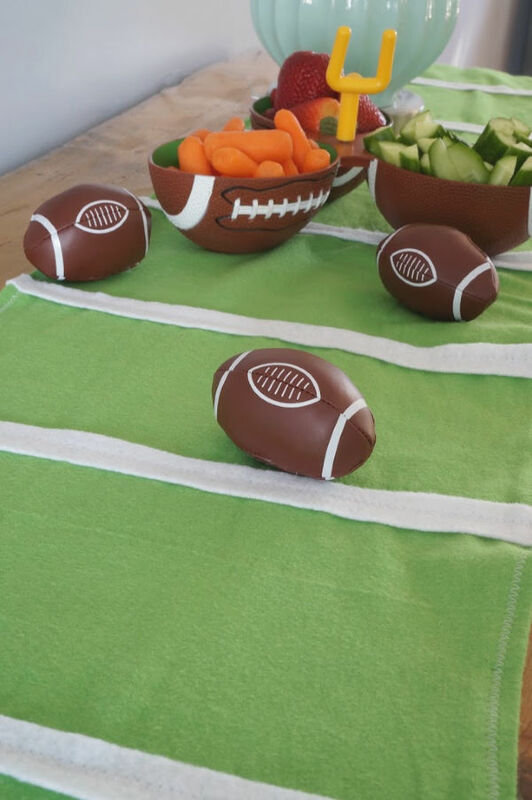 And this football field table runner makes the perfect addition to any Super Bowl party. Super Bowl Sunday happens to coincide with my husband, my daughter and my brother-in-laws’ birthdays. 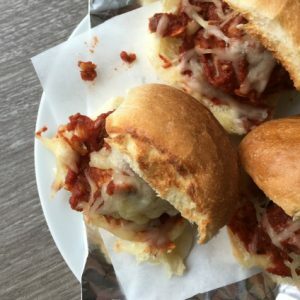 So, every year we bust out an awesome Super Bowl party. I love hunting around for fun games to play and football themed decorations. For the last couple of years I have been looking for something special for the buffet table. Let’s face it, while everyone is excited about the football game, they are really most excited about the food. So, where the food is served is very important. This year I decided to make a super simple football field runner for the table. 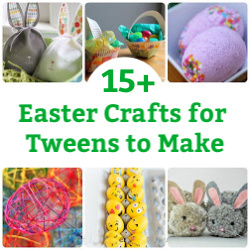 This project is so easy to make – sew it or glue it. 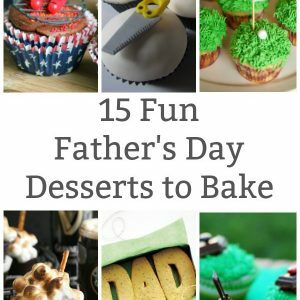 Then pile on the platters of food and get ready for the party! Begin by preparing the football field. I happened to have a couple of scrap pieces of green flannel, but you could use any green fabric for the grassy field. To fit on our buffet, I made my runner 5 feet long. I needed to join two pieces of 3 feet long pieces of fabric together in the middle. The seam will be hidden by the yard lines. I cut the fabric to 13 inches wide. 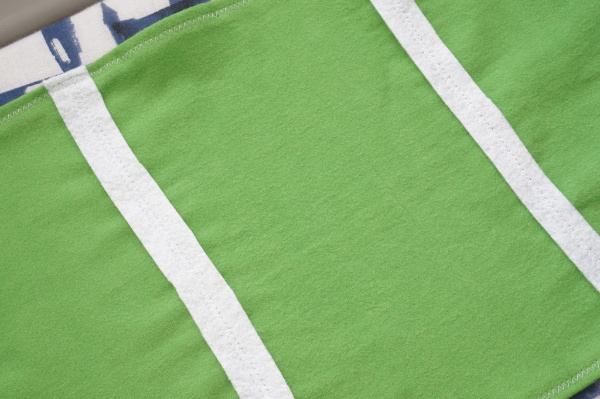 Iron the green fabric, so it is totally smooth and ready for the yard lines. 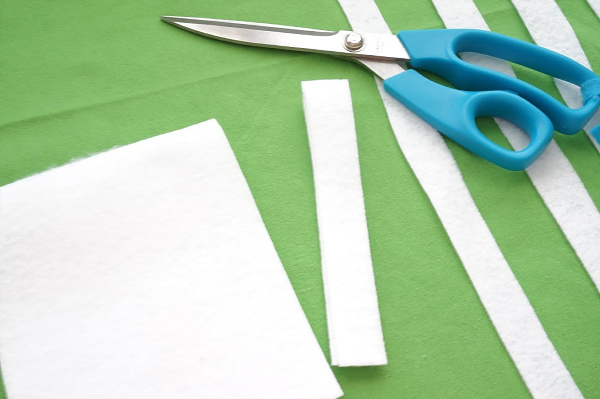 To make the white felt yard line stripes, measure out and cut 1 inch strips across the length of the white felt. You will end up with 9 strips that are 12 inches long. 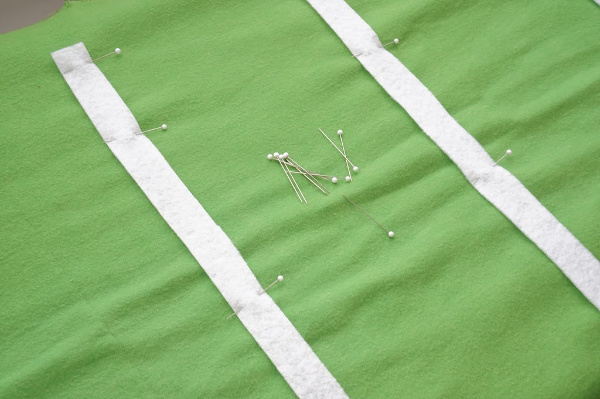 Starting in the middle of the green fabric, pin the yard lines in place. The middle yard line will hide the seam. I placed the yard lines 6 inches apart on the green fabric. Depending on the length of your runner, you might want to adjust the distance between the yard lines. Once pinned in place, sew the lines in place. Alternately, you could use a fabric glue to adhere the felt to the flannel. Follow the glue instructions. Once the the yard lines are sewn in place, it was time to hem the runner. Fold the hem of the fabric under, using two folds. Pin the hem and iron in place. 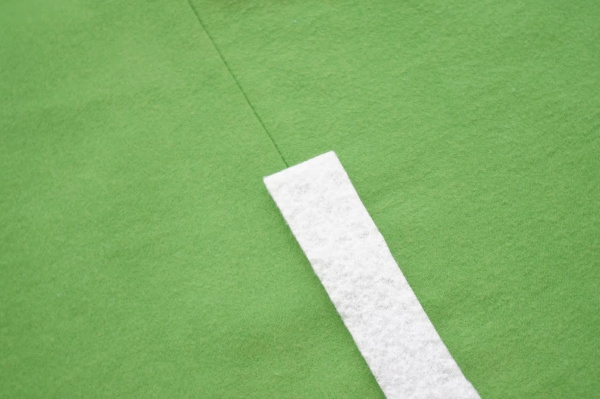 The double fold will tuck the ends of the felt yard lines in place – further securing them. Be careful when you touch your iron to the felt. Most felt will melt if it is heated…move quickly. 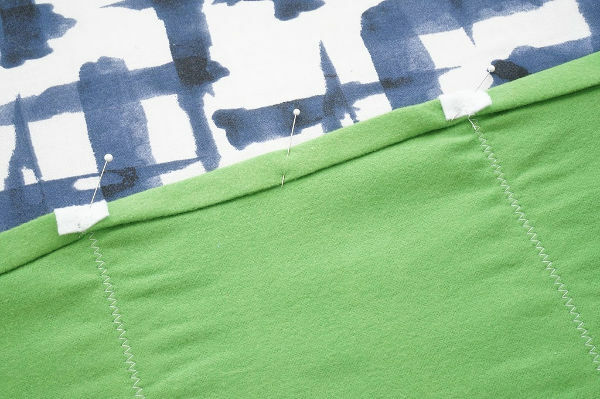 Once the hem is pinned all the way around the runner, sew the hem in place. Hand stitch or use a sewing machine for the hem. You could use fusible hem tape to secure the hem, if you don’t want to sew. However, you will need to be careful with the felt yard lines. Protect the felt by placing a piece of fabric over the felt. This way the felt and the iron will not come into contact with each other. Now your Super Bowl table runner is done. I opted to keep our football field runner very simple. You could add the yard line numbers if you like. I liked the idea of it being a more simplistic playing field. Spot clean the runner and hand wash/hang to dry the runner as needed. The best thing about this Super Bowl table runner is that I can roll it up and store it with all of our party gear and bring it out year after year. Too many of our modern party supplies are disposable – plastic dishes, cutlery and plastic table cloths. 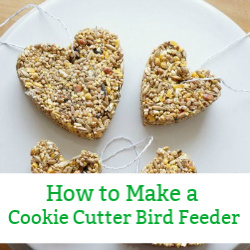 Anytime that I can make a reusable item – from scraps of fabric I have around the house – I am super happy.